The Smok NBC Bottom Coil Tank Clearomizer holds about 3.5ml of e-liquid, perfect for those looking for extra e-juice capacity. The NBC Tank Clearomizer is very easy to maintain and clean. The NBC Tank Clearomizer is also easy to refill - simply hold the tank upside down, unscrew the bottom base, tilt at a slight angle and fill with e-liquid (do not fill through center airflow tube, or liquid may leak through the mouthpiece or the bottom). 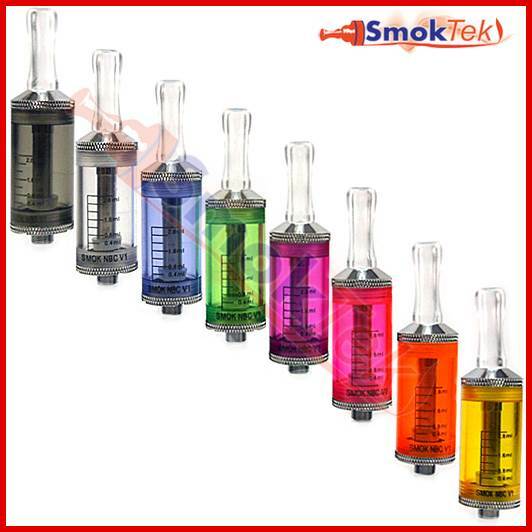 Do not overfill and do not allow the clearomizer to get below 1/3 full - these steps help prevent leaking. To change the replaceable coil head, simply unscrew the base, unscrew the old coil, and screw in a new one. If using a new coil, set the clearomizer aside for a few minutes to allow the coil to become saturated. Please note that we do not currently carry replacement coils for this atomizer. The NBC Tank Clearomizer is 510-threaded and will work great with 510 threaded devices/Mods; it is also compatible with eGo batteries (make sure to pick up an eGo cone to hide the threading on your battery). It is about 19mm in diameter and has a total length of 68mm with the drip tip installed. Each unit comes pre-installed with a 1.8 ohm coil. So glad I tried this, I can actually taste the flavor. The smaller clearomizers are so hard to get any taste through without puffing your brains out. The NBC bottom coil tank are excellent. I have not had one problem since using these. I would recommend this product to anyone. Thank you SmokTech ! Q: Is the tank Pyrex glass or plastic and can I buy replacement parts and tank separately? Are there other replacement parts that you're looking for? We're glad to help! 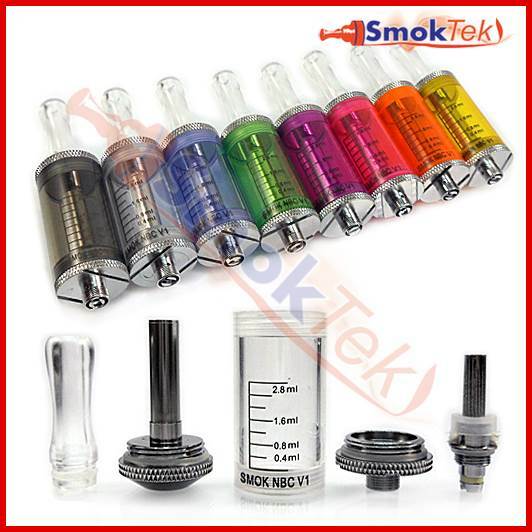 The Smok 3.5ml NBC Bottom Coil Tank Clearomizer takes single-coil replacement heads. Q: Where do I get replacement coils? Thank you for reaching out to us! The replacement coil heads for the Smok NBC are difficult to find, as the manufacturer as significantly reduced production on these coils. We are no longer able to stock the coils, so we have all tanks that use the coil on sale or in the Clearance section. Q: I love this tank and mine just cracked. Do you have any Idea where I can get a couple?